Start elevating your lifestyle with Spraymiss, our unique, touch-free dispenser & Cleanzing Waters. Try it, and you’ll say: Goodbye Dry ~ Hello Clean! Say goodbye to wet wipes that are destroying septic & municipal water systems and polluting our waterways & oceans with microplastics. Using Waters in the bathroom with your favorite toilet tissue instead of wet wipes, doesn’t just elevate your personal hygiene, you are reducing the environmental impact on the Earth. Cleanzing Waters are also a wonderful facial refresher. Mist Waters onto a cotton pad, wipe gently, & your face feels clean, soft & refreshed. If you are sensitive to scents, use our Unscented Waters. Cleanzing Waters truly refresh every part of you. Cleanzing Waters are pH-balanced to match women’s natural pH, making them also safe for babies & men. Plus, by using a Spraymiss dispenser with our Waters, & our 100% cotton luxurious Cleanzing Towels with uniquely oversized Wipe & Washcloths®, parents can wipe their babies, while helping to protect our waterways & oceans. In addition to Waters, Cleanzing Hair & Body Washes, Hair Conditioners & Moisturizers extend the Cleanzing refreshing experience! Cleanzing Company’s Purely Unscented and naturally scented hygienic products are designed to delight women, men & babies. If you prefer scented grooming products, ours include Sweet Pea, Citrus Verbena, Lavender Chamomile & Green Tease. Cleanzing Hair & Body Wash is the perfect hand washing soap. Used with our Spraymiss dispenser, you’ll experience touch-free, sanitary dispensing. For your hair, Cleanzing Hair & Body Wash can be dispensed with our 34 oz. squeeze bottle for a super-luxurious hair-washing experience. Paired with our Hair Conditioner, Cleanzing’s hair products leave all hair types super-soft & shiny. Simply adjust the amount of conditioner you use to obtain the conditioning & control you desire. After using Waters & our Hair & Body Wash & Conditioner, you’ll want your entire body to feel enriched, soft & refreshed – so dive into a Cleanzing Moisturizer! For your face, we recommend our Purely Unscented Moisturizer, made with the highest-grade, natural and hypoallergenci moisturizing ingredients. Your face will feel smooth, light & bright! Both our Unscented & scented Moisturizers assure smooth skin & the softness you long for. Cleanzing Moisturizers are dermatologist-tested & made with organic ingredients that nourish dry skin. Pair your favorite scented or Unscented Waters, Hair & Body Soap, & Hair Conditioner with your favorite scented or Unscented Moisturizer for the finishing touch of luxurious self-care. 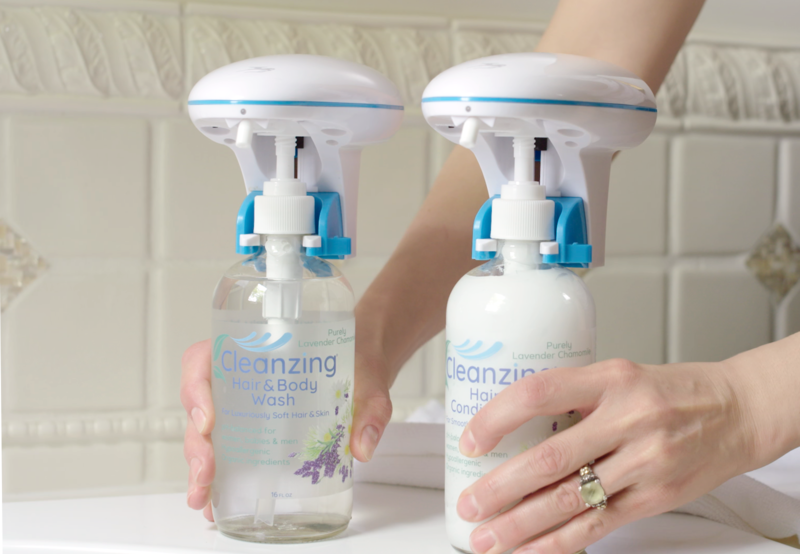 All Cleanzing scents are made for women, men & babies – because everyone deserves a refreshed Cleanzing body! Cleanzing Dish Detergent is a powerful cleaner that blasts away grease, but is also pH-balanced, hypoallergenic and gentle on sensitive skin. 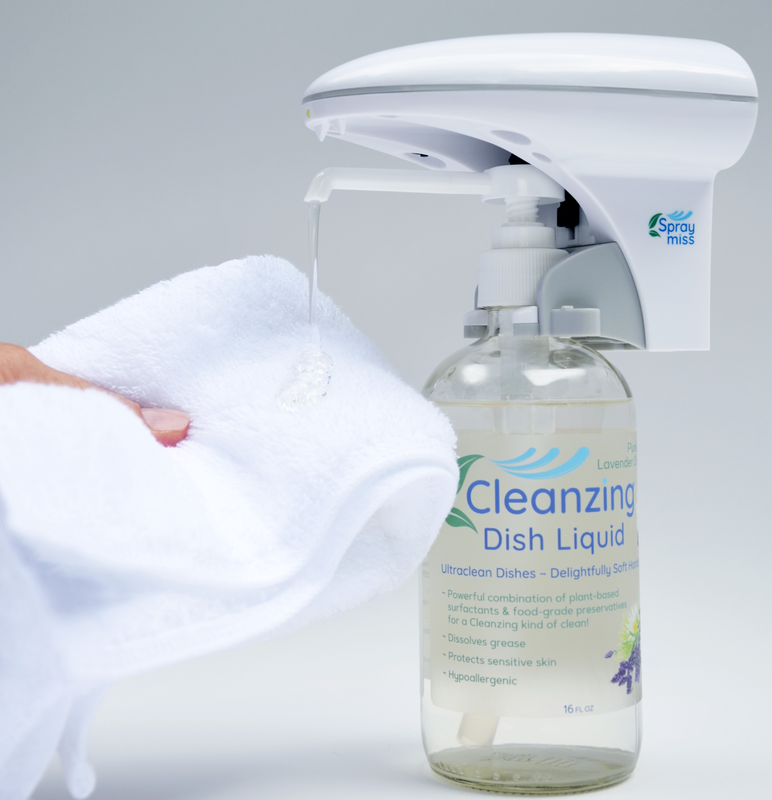 Combined with a touch-free Spraymiss dispenser, Cleanzing Dish Liquid provides the luxury you deserve. No germs. No fuss. Just wave your hand near the dispenser and it automatically dispenses Dish Liquid. And when your finished, dry your hands with our super-absorbent, 100% plush towels…just like the ones found in the finest hotels! Choose from our Oversized Wipes & Washcloths, or Hand Towels. Either way, you’ll love ’em and they’ll love you back! When it comes to the wash, Ultra-concentrated Cleanzing High Efficiency Laundry Detergent can’t be beat! Our HE formulation reduces the amount of water needed, while providing deep cleaning, grease-busting stain removal. Using 1 to 2 ounces in front and top loaders, Cleanzing HE Laundry Detergent works in either cold or hot water to muscle away tough stains. 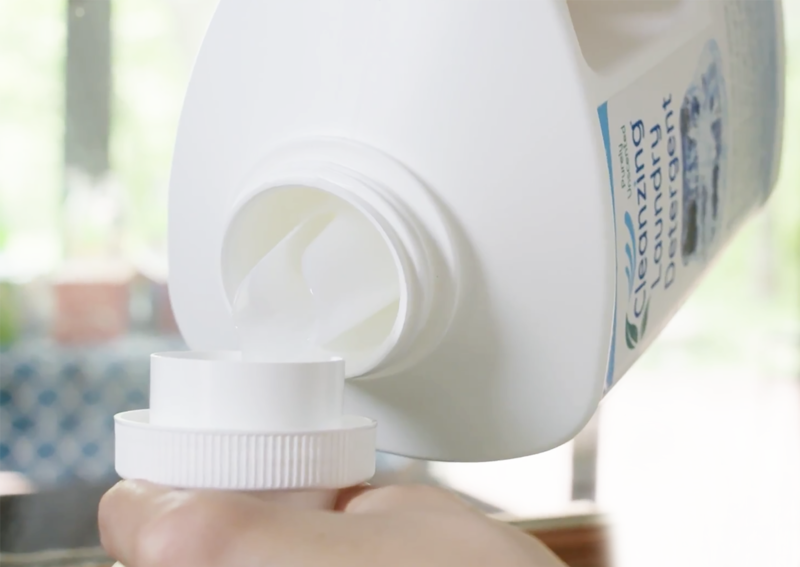 One 100 FL OZ bottle contains enough power to clean up to 100 loads of laundry! Available unscented, or in Citrus Verbena, Lavender Chamomile & Iced Mint, you’ll love how fresh and clean your fabrics will feel and smell. It’s that special place where you want everything perfect for the little ones. 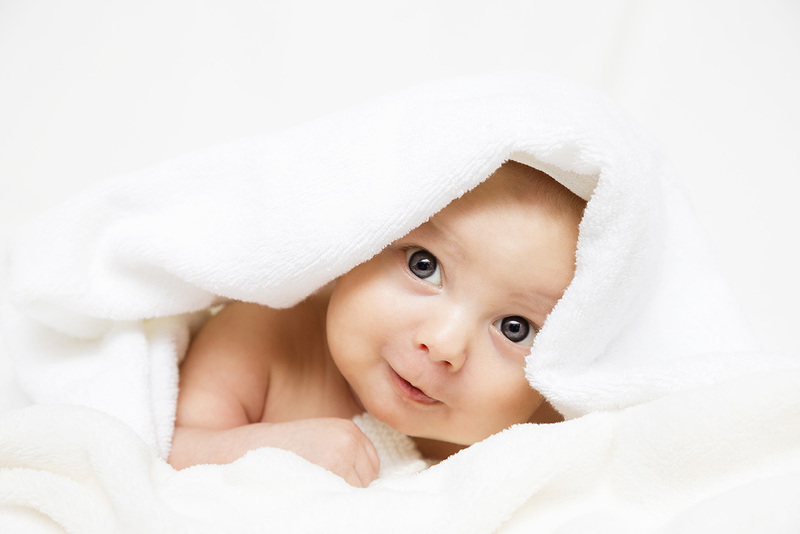 pH-balanced, hypoallergenic & dermatologist-tested, Cleanzing Waters are safe for babies. Plus, by using a Spraymiss dispenser & our 100% cotton, luxurious uniquely over-sized Cleanzing Wipe & Washcloths® towels, parents can wipe their babies, while helping to protect our waterways & oceans.